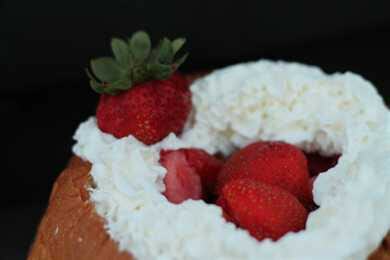 One of my favorite recipes to make with the Kings Hawaiian Sweet Bread is a Strawberry Shortcake Bowl. My family loves this because they can grab the bread off the sides of the bowl and dip it in the syrupy mixture inside. Below I have included my recipe of how I make this dessert. Cut your strawberries into quarters and place in a container with a lid. Add 3 tbsp of sugar. Place lid on container and shake. This will coat the strawberries and make them syrupy. Using a long knife, cut a hole out of the center of the bread, creating a bread bowl. Cut the excess bread into cutes. Add cubed bread back into the bowl to fill it about half way. Pour strawberry mixture over the top. (Optionally) Brush the outside of the bread bowl with melted butter and garnish the top with a layer of whipped topping. Add extra strawberries to the top to garnish. We not only use this delicious bread for dessert, we also use it for cheese balls and even to serve soup in! This is one of my favorite recipes to share with friends and family. What is your favorite dish to share with the family?